It's always refreshing to encounter a first film from a young director, or in this case second feature from two young directors, that does not scream of a childhood fed by MTV and the Hollywood product. It's especially pleasing when the film is as wonderfully restrained and as cinematically assured as Juan Pablo Rebella and Pablo Stoll's Whisky. The style is set in the opening shot, which if caught unprepared could be mistaken for Abbas Kiarostami, a through-the-windscreen view that does not reveal the driver and does not cut away (opening credits aside) until the vehicle arrives at its destination. And yet without aid of dialogue we are shown a journey to work that starts early in the morning and covers considerable distance, and even before we meet sock factory owner Jacobo Köller, we know something about his life and daily routine. Indeed, routine governs the otherwise empty lives of both Jacobo and factory supervisor Marta, whose paths cross only when Marta brings Jacobo his mid-morning coffee, always interrupting a failed attempt to fix the blinds that rob his office of natural light. Jacobo's mother has recently passed away, and he is soon to be visited by his long lost brother Herman, who has pursued a similar career to him but in Brazil and with far greater success. 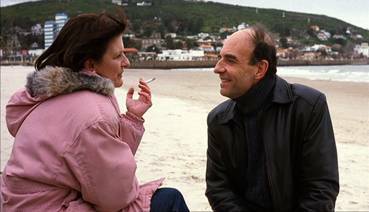 Wanting to convince Herman that he has made something of his life, Jacobo asks Marta to pose as his wife for a few days, but the situation is complicated when Herman suggests that all three take a short holiday together. It is both inevitable and appropriate that Whisky has been compared to the works of Aki Kaurismaki, an association that does the film no harm at all. 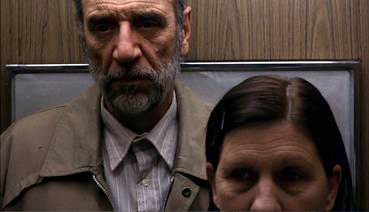 In particular the look, pace and tone recall Kaurismaki's excellent 1990 The Match Factory Girl [Tulitikkutehtaan tyttö], with its focus on the unglamorous details of everyday life and work and the unforced observational comedy that arises from this – Jacobo's deadpan weariness at his car's repeated refusal to start, his request that a café light be switched on only to have the owner stand on a chair and tap the loose fluorescents, the too-big wedding ring that falls off Marta's hand the moment she lowers it, the hilarious reveal of Jacobo's weary face as soapy water is wiped from the windscreen of his car. The film excels in communicating a good deal of information with the simplest of techniques, in particular through a superb use of seemingly inconsequential cut-aways that provide windows to verbally unmentioned back stories – two simple shots, dropped in casually amidst others on Marta's arrival at Jacobo's flat, tell us much about the departed mother's final years and of Jacobo's own commitment to her, something emphasised later by a similarly offhand image of him returning an object to its former position after its earlier removal by Marta. Particularly telling is the effect the arrival of Herman and the improvised holiday has on the pair. For Jacobo it represents a reminder of what he has failed to achieve, of a sibling rivalry that once saw him always beat his brother at air hockey, but later left him to take care of their mother while Herman left home to find love and a family and success, things that have continued to elude Jacobo. For Marta, however, Herman brings an energy, hope and even joy to a life that has for some time been devoid of all three. In keeping with the film's style, directors Rabella and Stoll build on this in the final third without ever being explicit – everything, even the significance of the ending, is left for us to interpret, but the pointers are always clear. Whisky is minimalist in the very best sense of the term, never wasting a shot or a look or an edit, creating and engaging us with sympathetic and interesting characters by focussing on the ordinary rather than the extraordinary. The three lead performances are all beautifully understated, and like the Kaurismaki films to which it has been compared, the film admirably demonstrates that unhappy characters can still make for an involving, wryly amusing and even curiously uplifting film. A nicely judged review on the IMDB carries the headline: "You will miss these characters." I already do. For those who do not know, the title refers not to the drink, but to the word used in Uruguay to prod faces into a smile for photographs, an action that twice has significance to the film's narrative. Much of Whisky appears to have been shot using source lighting or minimal practicals, resulting in scenes that play in sometimes very low light levels, often a challenge for DVD compression. The transfer here, however, is very impressive, handsomely showcasing Bárbara Álvarez's often splendid framed and tonally beautiful cinematography, again echoing Timo Salminen's work on Kuarismaki's aforementioned The Match Factory Girl. Sharpness and colour are very good – the contrast seems a little strong in places, but this is how the film played in the cinema and feels right for its tone and look. Blacks levels are rock solid throughout. The picture is 1.85:1 and anamorphically enhanced. The DVD cover lists the soundtrack as being 5.1, but it is in fact Dolby 2.0 stereo, but I seriously doubt a 5.1 track would have made any difference to a film that uses its soundtrack with the same economy and inventive minimalism as it does its action. Clarity and range are fine, and the sound here serves the film well. The Trailer (1:54) is non-anamorphic 1.85:1 and of a quality that is some way short of that of the main feature. Some of the darker shots show just how important a decent transfer is to the full appreciation of the film, as characters are silhouetted and facial detail is lost. Making of Whisky (27:03) is framed 4:3 and starts with some behind-the-scenes DV footage of the opening of the factory shutters, emphasising the importance of Bárbara Álvarez's cinematography to the look and atmosphere of even the most straightforward scene. In what is a rare thing for me, I actually fast-forwarded through actress Mirella Pascual explaining how she interpreted the character of Marta – it's nothing against her, it's just that I by then had a very specific view of the character in my own mind and was just not ready to hear her deconstructed. But it's there to go back to. There is some interesting audition footage, especially as lead actors Andrés Pazos and Jorge Bolani also auditioned for each other's roles, which makes for an intriguing peek at how things might have been. Script readings, rehearsals and film footage are intercut, and the final five minutes are made up of rapidly edited grabs from shot footage, including some cheery banter from the young crew. The final "Whisky" improvised crew portrait suggests a frindly and enjoyable shoot. The Deleted Scenes (10:24) are non-anamorphic 1.85:1 and consists largely of alternate takes of shots included in the film. The Directors' Biography is brief and to the point. It seems a rather nice coincidence that the very day after we screened Whisky in the cinema the review disc landed on my doormat, and it's particularly nice to report that the film plays as well on DVD as it does on the big screen. No film in which the characters are dour for a large part of the running time is going to be an easy sell, but Kaurismaki fans should find themselves well at home here, and I would urge all but the hopelesly impatient to give it a look. The presentation on Artificial Eye's region 2 disk is first rate, and I choose my words deliberately when I say it comes warmly recommended.